This week I’m taking a break from work. Luckily part of my pay seems to be supplemented by a generous vacation policy and so each spring I find myself taking a week to stay at home alone and make things. It’s lovely that I have this luxury. Unfortunately, leading up to vacation I spend so much time thinking about what to make that by the time my week off rolls around I get a little too overwhelmed to get things done. I spend more time plotting and less time doing. But this vacation I’m determined to not let that be the case. Below you’ll see all the beautiful messes I’ve made so far. 1. 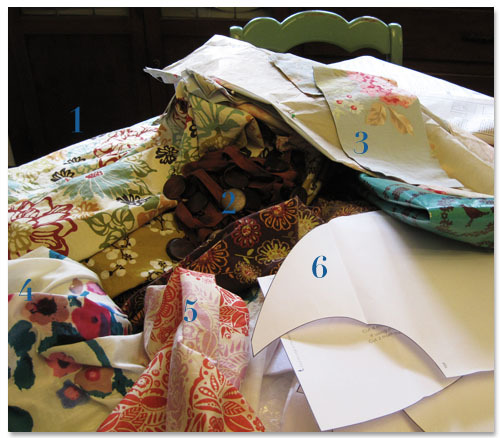 The selection of fabrics–exterior, interior and yoke — I picked out to make the Amy Butler Fringed Hobo Bag for me. 2. Wooden bead tassel for the edging on my hobo bag. I was feeling bold and crazy. 3. A dress pattern cut from a duvet cover purchased at Goodwill. 4. Vintage style flower fabric intended for New Look’s style 6020 dress. 5. Anna Maria Horner’s Voile. It might become a skirt because I love the pattern so. But it might also become a summer robe because it’s so soft it feels like luxury. 6. A pile of bag patterns cut out. Some to be used for my hobo bag. Some to be used with the great Echino laminated print resting on top of them. 1. A mixed bowl of cinnamon and sugar to top my homemade graham crackers. 2. 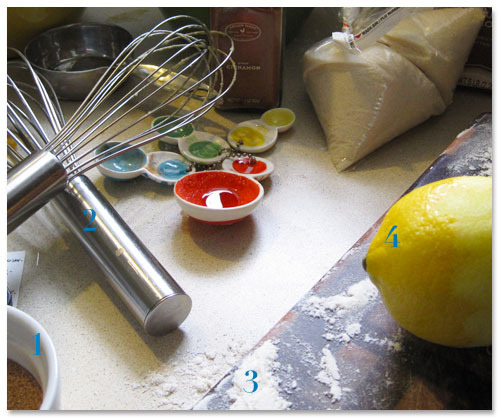 Whisks still dripping with custard. I’d never made it before, but it seemed like a good time to try. 3. Flour left over from rolling some rosemary bread into mini loaves. 4. A lemon for zesting because that makes almost every recipe better. No numbers required. Our neighbor’s yard is a mess. We’re keeping the dandelion problem at bay. And it is so, so satisfying. Look at that pile! So, that’s how I’m rolling this week. Making lots of crafts, baking and cooking lots of foods and enjoying being out in the yard whenever I feel. Hopefully I’ll gain some creative momentum this week to keep me rolling through summer. How would you spend a week off? I love the floral pattern in 4 above. I will be so jealous of the dress you make with it and may just have to borrow it! Miss you this week, but glad you are enjoying your time off! I found a pants pattern that I thought would be perfect for our desired “What I wore” red pants. If I can pull them off for me, you get a pair too! Haven’t read your post yet, but did you know “A Beautiful Mess” is a Jason Mraz song that is fabulous? Wow, look at you! Your kitchen must smell fabulous, and you’ll have a cute summer wardrobe in no time! 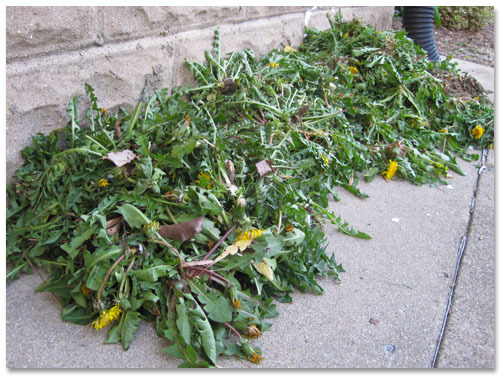 Those were some pretty healthy looking weeds. too, sheesh!